The World Economic Forum recently announced the water crisis as the No. 1 global risk based on impact to society. One in nine people lack access to safe water; 2.5 billion people do not have access to basic sanitation; and every minute a child dies of a water-related disease. And yet, for many people across the globe, access to clean water is as easy as turning on a tap, and the plight of the 750 million people who lack access to safe water can seem remote. To resolve this disconnect, many organizations are turning to digital channels to get their message out, with astounding results. Given that more people have access to mobile phones than toilets, all eyes are on digital as a way to bring this issue close to home. The 2014 Cone Communications Digital Activism Study found that Americans are primed and ready to support causes they care about online. And the recipe for engagement is quite simple. When asked what factors would motivate Americans to participate in social and environmental issues or campaigns online, nearly 4 in 5 consumers stated they’d get involved if there was an urgent need for immediate support (79 percent), it was clear how their support would make a real impact (79 percent) and it was easy to participate (77 percent). Organizations looking to drive understanding and action around water scarcity should keep these three drivers in mind: impact, urgency and ease of participation. Showing Americans how their small efforts can actually make a difference is a strong motivator. In fact, highlighting impact can even trump brand recognition -- nearly three quarters of Americans say they’d rather make an impact on an issue than be familiar with the organization they’re supporting. UNICEF’s Tap Project shows how even the act of unplugging from your digital device can make an impact. This year UNICEF is asking Americans to “unlock 14 million days of clean, safe water for children around the world” by staying off their phones. After visiting the dedicated mobile website, users can accept the challenge of providing one day of clean water for a child in need for every 15 minutes they keep their hands off their phone. As users count down the minutes, mobile screens light up with facts about UNICEF’s work, how users match up against record holders and words of encouragement to keep going, highlighting individual and collective impact. Once they have achieved the goal, a donation is triggered from one of UNICEF’s partners. With a crisis that is so far away from home, it’s hard for most Americans to process the magnitude and importance of the issue. Yet, individuals can be motivated to get involved – that’s clear from the outpouring of support and donations we see following major international disasters. Storytelling is one of the most powerful ways to create that sense of urgency – showing individuals just why this issue is not only acute, but far-reaching. To weave that narrative, storytellers can leverage the content Americans most want to see -- written articles (48 percent), videos (44 percent) and pictures (42 percent). 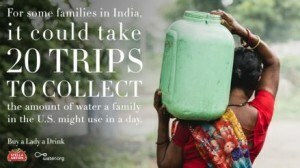 Earlier this year, Water.org and Stella Artois launched “Buy a Lady a Drink” at the Sundance Film Festival. The campaign features a series of short, yet powerful, films illuminating the real lives of women who spend their days hauling water back to their homes. Through highlighting the personal stories of these women and just what is at stake on their difficult journey to a clean water source (which can oftentimes lead to wells that are broken or tapped dry), Water.org helps to make the issue tangible and urgent. To encourage consumers to take action, Stella Artois created a chalice inspired by the cultural heritages of India, Ethiopia or Honduras which consumers can purchase for $12. Every chalice purchased will provide five years of clean water for one person in the developing world. The campaign proved to be so successful, they quickly sold out of the first edition of chalices. When it comes to engaging Americans around issues online – the easier the better. And each click of a button is more valuable than you may think. Sixty-four percent of Americans say if they “like” or “follow” an organization online, they’re more likely to support that issue in other ways such as volunteering or donating. Charity: water makes supporting the global water crisis as effortless as turning a year older. The wildly successful charity: water birthdays campaign asks individuals to donate their birthday to the cause, accepting donations rather than presents. Users simply pledge their birthdays via their Facebook account and watch as the donations pour in. The campaign has already raised $9 million (an average of $770 per birthday) and recruited a host of celebrities to promote the effort. Founder Scott Harrison also hopes to put sensors on wells built by the nonprofit, so donors can see just how much water flows from the wells they helped build. The water crisis is just one of many global issues we face today that requires immediate aid, making it increasingly important to frame every cause to motivate for action – and digital gives us ever more opportunities to do this. By positioning campaigns as urgent, impactful and easy to get involved, marketers can harness the power of digital to push forward pressing social and environmental issues. Creating a campaign with a digital activation? Check out the five digital engagement principles from the 2014 Cone Communications Digital Activism Study. Whitney Dailey is a supervisor at Cone Communications on the CSR Insights & Intel team, where she leads the development and distribution of industry-leading research studies, including the 2014 Cone Communications Digital Activism Study and 2014 Cone Communications Food Issues Trend Tracker. Her expertise in corporate social responsibility, sustainability and social media helps to guide thought leadership at the agency. Whitney is a guest lecturer at Harvard University, Boston University and Simmons College and tweets at @WhitneyDailey.